NHV Group and Airbus Helicopters announce NHV’s H175 fleet has logged its first 10,000 flight hours. The significant milestone proves the super-medium-sized rotorcraft’s capabilities and reliability in highly demanding operations, especially the transportation of personnel and supplies to offshore oil and gas platforms. The 10,000 hours have been accumulated by NHV’s fleet of eight H175s. The first two aircraft were introduced to the fleet in December 2014 with NHV being the launch operator. The rotorcraft have since completed more than 4750 flights, with certain missions conducted in challenging North Sea weather conditions and non-stop flights performed to distances of 180 nautical miles with passengers and cargo. “Being the launching customer and fleet leader for this aircraft, we are successfully positioning the H175 as the new standard for oil and gas missions. I am proud that, today, NHV is the only operator with a vast experience in flying this aircraft. We explicitly thank our valued customers and staff for being our partners in reaching this milestone,” says Eric Van Hal, the CEO of NHV Group. 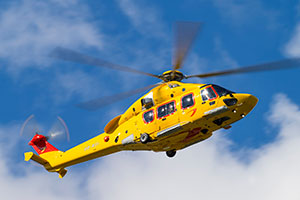 The H175’s high level of reliability enables NHV to meet tight flight-scheduling in the North Sea, thereby underscoring the aircraft’s high level of maturity from service entry, as well as the suitability of associated services provided by Airbus Helicopters. NHV will gradually increase its fleet of these new-generation helicopters in the upcoming years. The H175 is designed to meet evolving mission needs in the oil and gas industry, offering outstanding performance and unmatched cost efficiency with the capability of carrying a full payload to 90 percent of the North Sea’s offshore installations. It also is well-tailored for search-and-rescue in support of such off-shore operations, emergency medical services, public services, VIP and executive transport.